The objective of this study is to determine whether content optimization solely driven by RelevancyRank recommendations impacts organic search traffic from Google. The study used 3 randomly applied treatments of RelevancyRank modified content, random keyword modified content, and unmodified content. RelevancyRank modified content saw an organic traffic lift of 17.5%, random keyword modified content saw a 10% drop and unmodified content saw drop in traffic of 15%. This indicates that RelevancyRank optimized content can create increases in organic search traffic that cannot be explained solely by content freshness measurements or random fluctuations. Download [PDF] the latest, more complete analysis using Poisson Random Effects Model for Search Traffic completed by Andrew Cron, Ph D. The statistics reported below, while valid, are comparatively incomplete. Randomly select 200 pages from a single website: We use a single website to prevent domain authority from influencing the effectiveness of content modifications. There were 3 separate ways we could look at this data. and determine the percentage likelihood that a page would increase in organic traffic at all in each cohort. We look at each of these measurements for all 3 cohorts below. 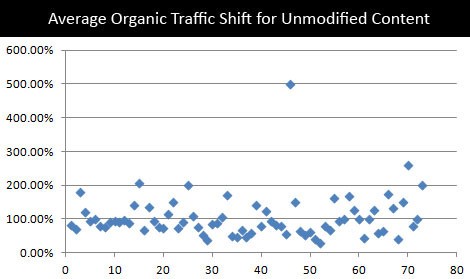 The average traffic shift for each page in the unmodified cohort was 105.65%. This means that on each page, on average, saw a 5.65% lift. However, we know this was skewed by looking at the following 2 measurements. The average traffic change when all pages were combined was 75.84%. This means that many of the more popular pages actually lost traffic during this time. Finally, only 1/3 of the pages in the unmodified cohort saw any positive movement at all. If you look at the graph above, you can see quite clearly that the unmodified cohort was skewed by a single outlier that jumped from 1 visit to 5 visits. 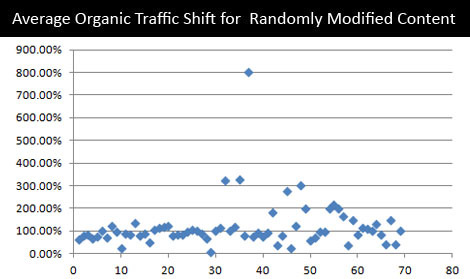 Within the random keyword insertion cohort, the average shift in traffic was 119.16%. This too was skewed by a very large outlier at 800% traffic increase. We can use the other two tests to confirm this. The total traffic shift when including all of the visits to the pages within this cohort was 84.61%, indicating a loss in traffic over the time period. Only 40.84% of the randomly modified pages saw a jump in traffic, the majority remaining unchanged or losing traffic. The cohort modified by RelevancyRank recommendations saw an average shift in traffic of 131.48%. This traffic shift corresponded with both the second and third metrics. When all traffic was combined, the RelevancyRank modified content still saw a 116.17% traffic shift, the only cohort to record a positive number and which was more than 30% greater than random. Perhaps most importantly, 63.49% of the RelevancyRank modified content had positive growth, while only a minority remained the same or lost traffic. Blind insertion of RelevancyRank recommended keywords to content can increase organic Google traffic, and that improvement cannot be described as caused by freshness ranking factors. We cannot conclude that topic modeling or content relevancy is used in Google’s algorithm. We cannot determine the exact mechanism by which RelevancyRank recommended keywords increase Google traffic. We can, however, provide evidence that insertion of RelevancyRank recommended keywords do increase Google traffic. 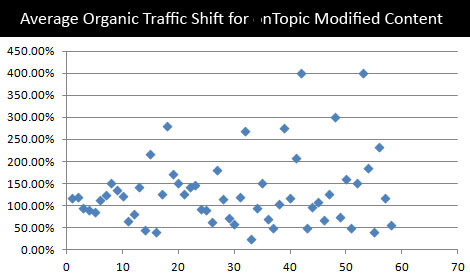 The graphs above show the raw results of traffic fluctuations following transformations for each keyword. There was variation in each cohort size because they were randomly applied.